Hi BwE, thanks for your awesome work. One unrelated question though, have you tried replacing a faulty PS4 APU? for example, take from a donor board and implanted it to another PS4. @derox this does not work - but i have not personally tried it. apparently it is linked to the console much in the way the NOR and syscon are. Now its 1.3.3. Seeing as updating my program is kinda important I made my program check if it's the latest all by itself! How exciting. The other parts of this update is described below. 1.3.3 (24/1/19) Reworked And Improved Both CID And UNK Sections Again, Added More MD5's, Added Application Version Checker, Removed Colored Bars, Added Comparator & Other Improvements Throughout. 1.3 (15/1/19) Completely Reworked And Improved The CID Section And Added Additional Validations To The UNK Section & I Also Improved Some Other Validations Throughout. 1.2.5 (17/12/18) Added 2 New Flags (Possibly Initialization Flag? ), Changed Validation Results, Improved Output/Info (HTML) & Added MD5's. 1.2 (8/12/18) Improved All Alt Validations, Repaired Vtrm1, Internal Typo & Added Repetition Checks. 1.1.1 (29/11/18) Typo Again, Made The SKU Not Come Up As Unlisted & Added Some MD5's. 1.1 (28/11/18) Improved VTRM & CID Validation, Typo Fixes & Better Colours. Version: 1.3.5 (30/1/19) Added CoreOS Reference Points (Additional CoreOS Per-Console Validation). So it turns out there are actual static/dynamic fixed areas within the CoreOS - after which is becomes truly random. I am sure there is more I can find in the NOR. I think the next update will have better validation within the repetition spectrum. That is nice finding and update. Never knows there is static section within CoreOS. Those static value is same within a console? Is it differs in each firmware? What's up gangsters. Im now on version 1.3.8! Same url. Both for my program AND FOR DONATIONS! condorman2018 and XfactorX like this. 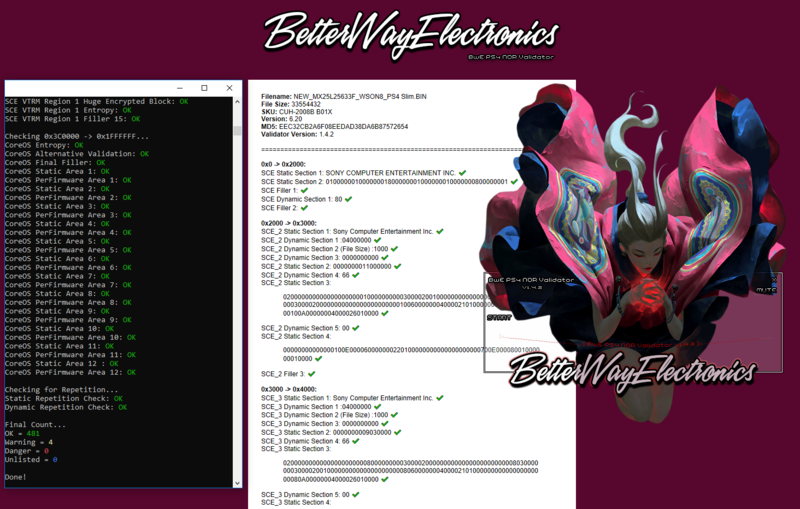 1.4.0 (1/3/19) Added Zecoxao Extraction Methodology (Will Add More Zecoxao SELF Stuff Later), Added FW/BIOS Versioning, Added Additional Entropy Validation & Various Improvements Throughout. Versions From Here On Will Be Released Slower Due To University Commitments! 1.3.8 (21/2/19) Added Additional Validations (To Suit Slim/Pro), Repaired/Improved CID Validation, More MD5s & Table Based Results. 1.3.5 (30/1/19) Added CoreOS Reference Points (Additional CoreOS Per-Console Validation).